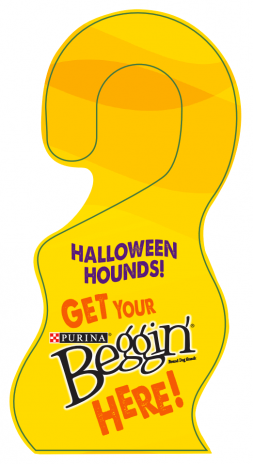 Beggin’ is the Official Dog Treat of Halloween and your dog’s favorite treat! We bet your dog is excited to share those Beggin’ treats with doggie pals who are waiting patiently to be adopted by a loving family. In order to help your family pet achieve this goal, Beggin’ and Petfinder have teamed up and are inviting you to show us how you’re celebrating Halloween with your dog. Do you dress them up? Does your dog do tricks for the trick-or-treaters? Do you and your dog dress alike? Does your dog trick or treat with the kids? If you said yes, great, that’s just what we’re looking for! Take a picture or video of your dog’s most hilarious Halloween moments and share them with us by posting to Twitter and/or Instagram with #Howloween! For every Twitter and Instagram post tagged with #Howloween in October 2015, Beggin’ will donate a bag of Beggin’ (up to 50,000 pouches) to the adoptable dogs at one of Petfinder’s thousands of shelters across the country because every dog deserves a treat during #Howloween! Think your dog will eat that up? Well there’s more! 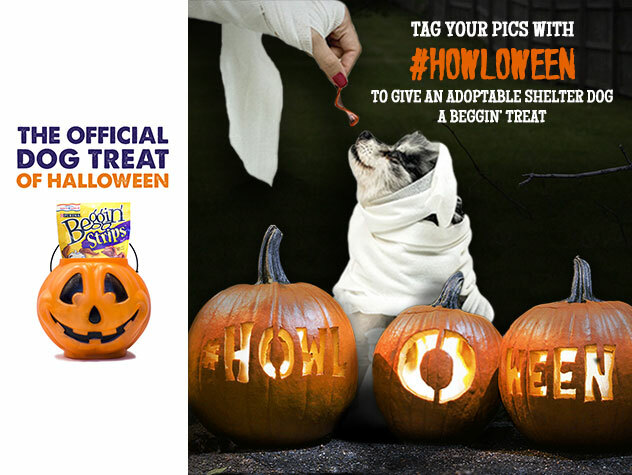 Users who tag their photos with #Howloween will also have a chance to be featured on the @beggin and @dogsofinstagram’s social accounts. What a great way to let your dog shine! Do you want to really let people know how much your dog loves Beggin’? You can download and print a Beggin’ door hanger. Use this door hanger to tell costumed pups and their human that you’re handing out Beggin’ this year to all of the 4-legged trick-or-treaters. Then prepare for the tails to start wagging! Beggin’ to hand out to all those wet-nosed trick-or-treaters? If you didn’t say ‘check,’ then stock up by getting $2 off Beggin’. Then share your dog’s hilarious #Howloween moments and join in on the fun by helping us reach our goal of donating 50,000 bags of Beggin’. Make this the best Halloween your dog has ever had! In the meantime, Beggin’ has also teamed up with the geniuses at BuzzFeed to do a hilarious new Halloween video called Watch Kids Teach Dogs Trick or Treating. Take a look and get some tips for yourself…if you can stop laughing hysterically, that is.